Facebook in a move to show more transparency about its efforts to combat Russian trolls, have publicly shared the removal of 70 Facebook accounts, 138 Facebook Pages, and 65 Instagram accounts believed to be operated by Russian government-backed trolls. While the social network has been on the hot seat in recent times following cases of election manipulations using data sourced from the platform, the company hope to be able to convince people that it’s not sleeping at the wheel of its affairs. 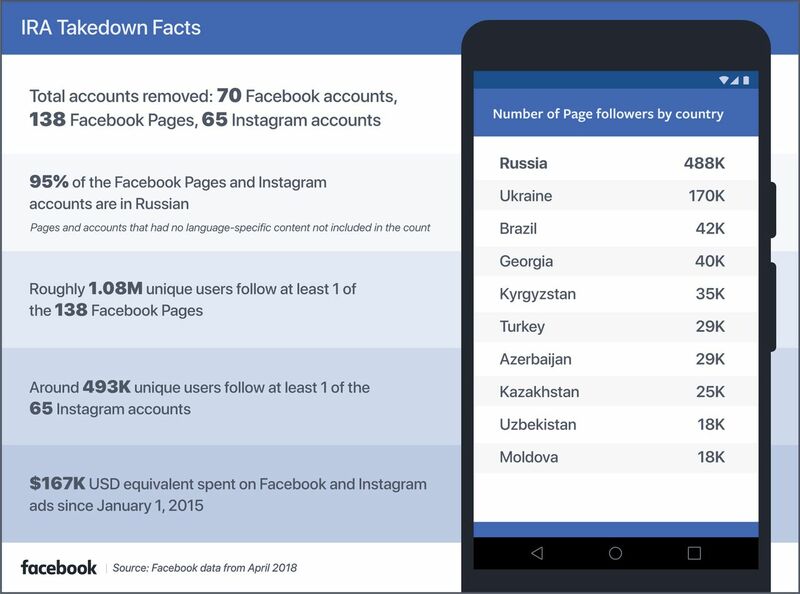 Facebook have shared both stats about the account deletions and samples of the content they removed, detailing the specifics of its efforts aimed at combating the menace of IRA’s election interference ploys. The company further explained that its analysis of un-paid organic posts revealed about 126 million people seening the propaganda group’s posts, with another 20 million haven seen the posts shared on Instagram. Other steps it has taken to prevent rogue nations from interfering in foreign elections, include the deployment of advanced AI tools to remove fake accounts and doubling its security and content review staff from 10,000 to 20,000 this year, with about 15,000 staffers working on tackling fake contents alone. Facebook also identified a large network that IRA is using to manipulate users in Russia itself. The IRA network totaling 95 percent of the accounts, which are operated from Russian; targeted Russia or Russian-speakers in neighboring countries including Uzbekistan, Azerbaijan and Ukraine. The company promise to continue in its effort to make it harder for foreign nation states to interfere in outside elections, and perhaps this is the first step towards a true transparent security procedures for the social network.